This shrub can live to about 70 or 80 years of age – coppicing, however, can dramatically increase its lifespan. 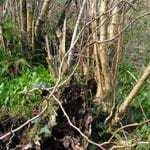 Coppicing allows the shrub to constantly renew itself. The ‘stool’ (the base of the plant that remains uncut) is the only part of the plant that reaches any great age. 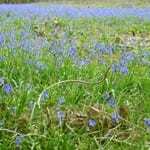 Coppicing is very good for wildlife, as it opens the woodland floor to more light and lets the amazing variety of spring flowers bloom, like lesser celandine, wood anemones, bluebells, wood sorrels and dog violets. Dog violet is an important food plant for caterpillars of fritillary butterflies. The leaves appear in May. Early growth can be tinged with red. They are alternate with a toothed edge. The surface is hairy and the round leaves have a definite tip. Hazel has male and female flowers on the same shrub. They appear on the plant in autumn and winter and may open as early as January, long before the shoots emerge. The male flower is long and yellow. The female flower is much smaller and red. They are wind pollinated – the wind carries pollen from the male flower to the female flower. The female flowers develop into fruits, which are real nuts. 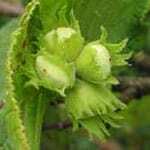 Each nut has a green, overlapping cover, called a husk (or involucre). They ripen through late summer and fall in September – when they may be brown. Large birds, squirrels and mice eat them and help disperse the plant, but they are also edible to us. The nuts contain 60% fat, 14% protein, calcium and vitamins B1, B2, E.
The light brown bark is smooth with yellow pores. The stems are able to regenerate quickly when cut. 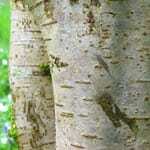 A typical coppice cycle might be anything from 7-15 years for hazel. The timber produced from coppice has many uses. Since ancient times hazel woven into a frame has been used in house building or as hurdles (fences) protecting sheep. Today coppiced hazel is mainly used for making baskets. 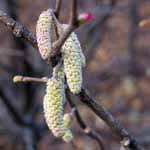 Hazel is a shrub or a small tree, which grows up to 15m tall. It needs non-acid and moist soil. 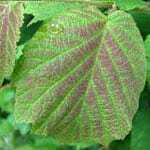 Hazel likes a mild climate and grows well as an understorey in oak or ash woodlands, but it can create woodlands on its own.